You will meander along the driveway to the foot of the detached property and into the characterful and generous hallway. However, before you enter the house you will fail to turn and take in those spectacular views. The lounge is a beautiful room with a traditional feel to it, with a substantial bay window showcasing those fabulous sea views. There are lovely wooden floors and a wood burning fireplace for those nights which demand a cosier atmosphere. A balcony sits off the lounge, with ample room to sit/entertain and is encased with a glass balustrade which means you can enjoy those views uninterruptedly. You can also utilise the dining area which lies openly with the lounge and leads us into the kitchen. The kitchen has a modern country design with its shaker units, granite worktops, double Rangemaster, room for an American style fridge freezer, wine cooler and breakfast bar. There is ample room for integrated appliances and there is also a very handy WC off the kitchen. Seawinds is arranged over three floors, so let’s venture down to the lower ground floor. Here you will find accommodation comprising a generous double bedroom with fitted wardrobes and window to the front framing the sea views. Next along is the study, a wine store and modern shower room. You have complete private access to this floor via a lovely sun terrace at the front of the house. This arrangement has great flexibility within the home and would be ideal for the extended/multi generation family. You can utilise the lower ground floor as a private floor or simply cherished space away from the rest of the house providing the perfect guest accommodation or workspace. We can now ascend to the first floor where you will find a master bedroom which houses fitted wardrobes and wonderful sea views. There are two further double bedrooms and a modern family bathroom which encompasses a freestanding egg shaped bath and separate shower unit. Externally, Seawinds is in glorious grounds. 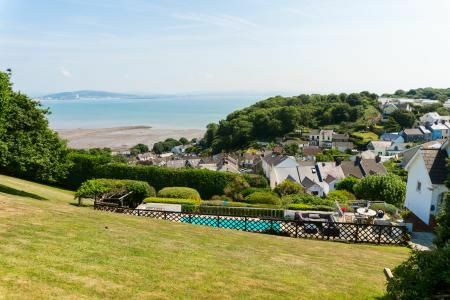 Placed in a popular spot close to the Mumbles front, you will be part of a close-knit community yet you will have the peace, quiet and privacy of a country dwelling. The grounds are lush with greenery and mature plants, which surround the focal point of the swimming pool and patio area. This lovely space encapsulates the magnificent sea views whilst providing a plethora of different pockets of entertainments spaces. An additional detached, double garage with room above is situated at the bottom end of the driveway, the room above is accessed via separate stairs to the side and is equipped with electricity and heating.